Recently I started the quest to find a large family tent for car camping. 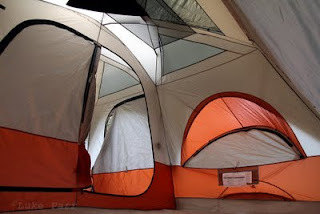 My wife and I looked at several tents at Sportsman’s Warehouse and Bass Pro, looking for a tent that would hold our family, stand up to various weather and would last us many years. We found a couple we liked at Bass Pro and searched the online reviews to find the good and bad about each tent. After a considerable amount of research, we decided on the Columbia Cougar Flats II tent. 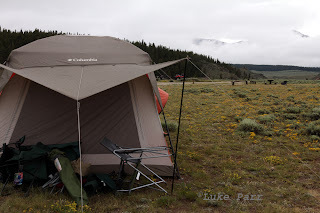 Columbia was a name that I recognized and most of the reviews of the tent were positive. We liked the size of the tent, 10x14 feet, with a divider in the middle to create two rooms. The build also appeared to be a little sturdier than some of the straight-walled tents that we looked at. We also liked that the tent has numerous large windows, including two bay windows that overhang, providing some protection from the rain while open. There is also an awning over one of the big bay windows. Once we bought the tent, we took it home and set it up in the back yard. I would highly suggest setting up any new tent at home before heading out on a camping or backpacking trip. The Cougar Flats II had color coded sleeves and hubs for all of the tent poles. Following the instructions the first time to get used to the proper order of set up made it easy to set up the tent after that. I also appreciated that the tent came with enough tent stakes to stake down every ring or tie down on the tent, I am amazed that some tents that include stakes do not include enough to stake down everything. When out in inclement weather it is always best to stake your tent as secure as possible to get the maximum performance out of it. 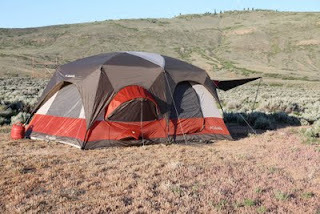 Our first trip with the tent was to Blue Mesa Reservoir. We found a campsite near the marina, but the few sites with trees were already taken. 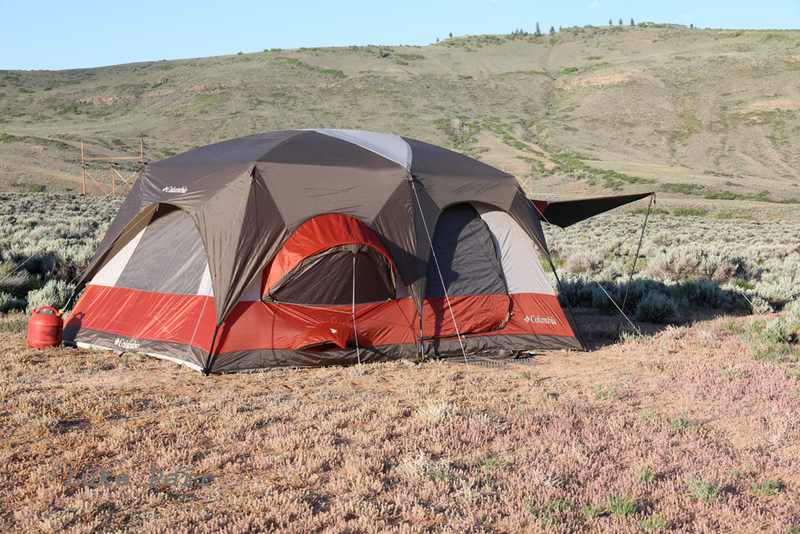 As a result, we set the tent up overlooking the Cebolla Basin of Blue Mesa. Every afternoon we had heavy winds and two nights we had rain. The tent held up great in the wind and we stayed completely dry inside. The only issue we had was one of the poles from the awning fell over twice during the trip. 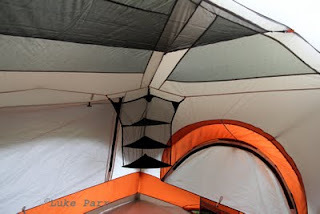 While inconvenient, it didn’t affect the inside of the tent or the performance of the rain fly. On the last night I secured the awning down in front of the bay window (one of the ways it is designed to be used), further protecting us from the rain and wind. While at Blue Mesa we were able to put the whole family in one of the rooms, and then use the second room (where the entrance doors are) as a storage area. The last day we set up a table in the entry room and used it to eat dinner while it was raining. Just be careful cooking inside a tent, it’s always better to cook outside, but if you have to cook in the tent, keep any open flames well away from the walls of the tent and make sure that you have plenty of ventilation. The second trip we took with the tent was to Taylor Park Reservoir. While at Taylor Reservoir, we didn’t have to worry about wind, but we had lots of rain. In fact, the first night it was pouring so hard that we couldn’t talk to each other inside tent without yelling. All three days that we had the tent set up we had rain to deal with, everything from torrential downpours to light misting. We never had to worry about the tent leaking or letting in water. The only time the inside got wet was the first night when we had to open the door to get inside while it was raining hard. A small pool formed inside the doorway during the brief time it took us to get inside. This was another great reason for the second room, as despite the water in the entry way, our sleeping area never got wet. We did have a couple complaints about the tent, although overall they were easy to live with. The first is with the awning. It extends out over the bay window, which makes it easier to open the window in the rain and gives you a place to set your chairs, but it would have been nice to have the awning over one of the doorways, especially during the rain. At 10x14 feet it is a big tent, while it is nice to have the room on the inside, it may be difficult to find a place to put the tent in some campgrounds. The other thing I didn’t like is the fact that the big bay windows on each end of the tent do not seal at the top. They use two clasps each to secure the top, which means that when the wind blows against it, the air flows directly up the window and in to the tent. With the entry room towards the wind, I found that when I closed the doors to the sleeping area, we did not get any of the wind in the sleeping area, but it would be nice to have the zippers go all the way around the big windows. Overall, I am very pleased with the tent. Both trips we have taken it on have tested it, in both wind and rain performance. So far the tent has held up well and will probably serve us for years to come. Do you have a family tent that you like? Share your thoughts in the comment section below! Not too long ago I mentioned how we bought a new Humminbird 768 Fish Finder for $200 rather than the regular price of $500, you can read the post here. We had installed the fish finder fairly easily, though we had to wait a little while to use it. 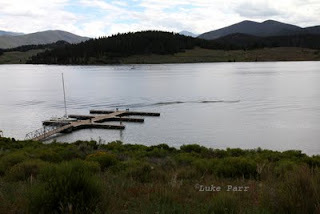 We had gone to Dillon Reservoir and tried to launch the boat, but we weren't able to start the motor, you can read about that trip here. As I mentioned in one of my last posts, we were able to get out to Green Mountain Reservoir and actually try out the fish finder. I'm not going to claim to be some kind of expert on fishing electronics. I also don't have a lot of experience with them, so the review that I am giving is based on using it for a short amount of time and based on my limited knowledge in fishing electronics. First off, we were very pleased with the display on the Humminbird, it is wider than our previous unit and adds a lot of detail. 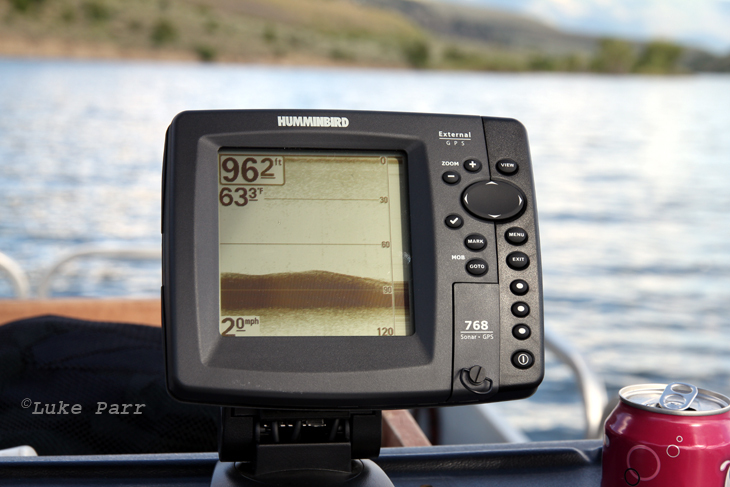 Our old fish finder would only display fish symbols and did not give you an option to view the raw data. I've heard many people say that it is better to view the raw data, rather than the symbol, because you can interpret it yourself, rather than rely on what the fish finder believes is a small fish, large fish or group of bait fish. Using the fish finder with the symbols off, I quickly came to realize how valuable this is. It will take me awhile to truely understand all the different returns, but I quickly started to get a feel for how large a fish might be and what appeared to be groups of smaller fish. I was also able to clearly see my downrigger most of the time. This was great for knowing exactly where my lure would be in relation to where the fish were. The old finder would show a line of fish where the down rigger was, that made it extremely difficult to tell if there were fish there or if it was just the downrigger. As I've mentioned in previous posts, with the old fish finder, we were having issues with getting depth readings below 100-120 feet. When the bottom dropped deeper than that, we would not only loose our bottom reading, but would also frequently lose all other display, the depth display would bound from 1 foot to 300 feet or more, even though we were likely in 100-200 feet of water. While Green Mountain Reservoir is not the deepest lake, we did get some strong readings down past 200 feet. We also enjoyed the fact that the fish finder gives temperature reading from the water at the transducer. That didn't give us an idea of what the temperature was down where we were fishing, but it was interesting to note the temperature change as we moved around the lake. The last feature that I would like to touch on is the GPS. I had really wanted the GPS option on our replacement fish finder, but I was worried that we wouldn't be able to find a unit that was in our price range. Fortunately this unit came with an external GPS receiver, so it was a simple task to secure the receiver and hook it up to the fish finder as we were installing it. Using the GPS, we were able to monitor our trolling speed through out the day, this was especially helpful as we would change directions and the wind would speed us up or slow us down. Without the GPS giving us speed readings, we would have had no idea just how much the wind was affecting us. 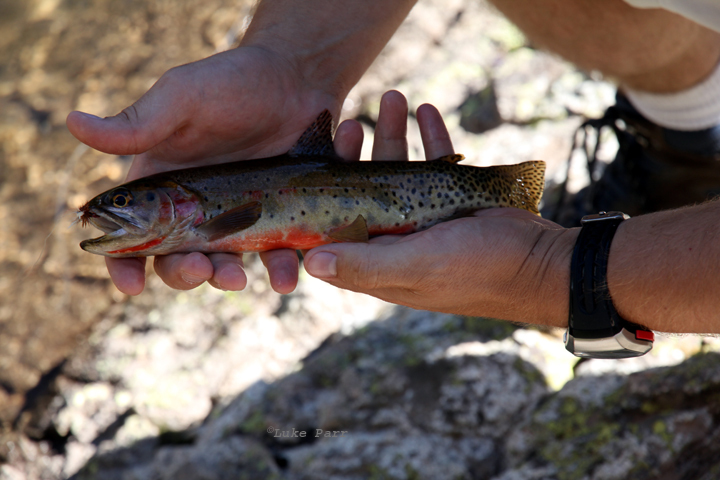 We were also able to use the GPS track to go back over the same schools of fish that we had marked on previous trips. This led to about a two hour window where we caught over a dozen lake trout and one salmon. As I write this I believe that the Humminbird 768 has been discontinued, that means that with a little bit of searching, you should be able to find a good deal on the unit. This fish finder will serve you well and I definitely would recommend it! Yesterday, my dad and I got a chance to fish Green Mountain Reservoir. Green Mountain Reservoir is located west of Silverthorne, not too far from Dillon Reservoir. Unlike Dillon Reservoir though, Green Mountain Reservoir is not just known for sailing and boating, but also for fishing. Offering Lake Trout, Rainbow and Brown Trout, as well as Kokanee Salmon, Green Mountain Reservoir has a lot to offer the angler. As I mentioned in my Dillon And Bust post, we had problems getting out boat started when we had arrived at Dillon Reservoir last week. We had figured out the problem and were ready to try again. When we got to Green Mountain Reservoir, there was no one else at the ramp and we were ready to give it a try. Fortunately the boat fired up right away and we were out on the water in no time. We trolled from the McDonald Flats campground west towards the dam. We caught a few Lake Trout as we trolled over the old river channel. 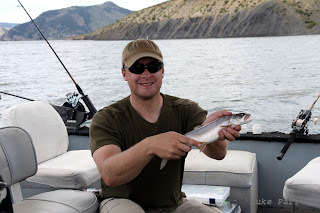 As we got further to the west we tried jigging in the deeper water, but that was quite unsuccessful. We also tried anchoring and casting in the shallower sections in the north west part of the lake, that was also unsuccessful. We figured we would start trolling again where we had caught the fish earlier. That turned out to be a great idea. From about 2:30 to 4:30 in the afternoon we caught about 14 more fish in the same area. 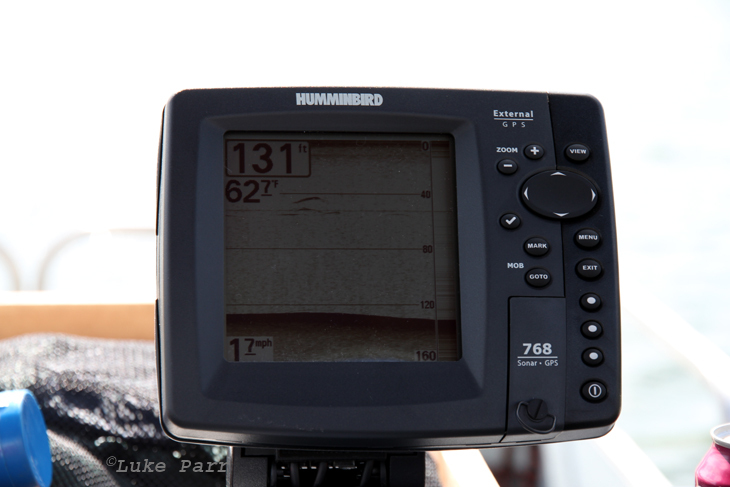 We would mark fish using our new Humminbird 768 then make multiple passes using the down rigger and lead core line. 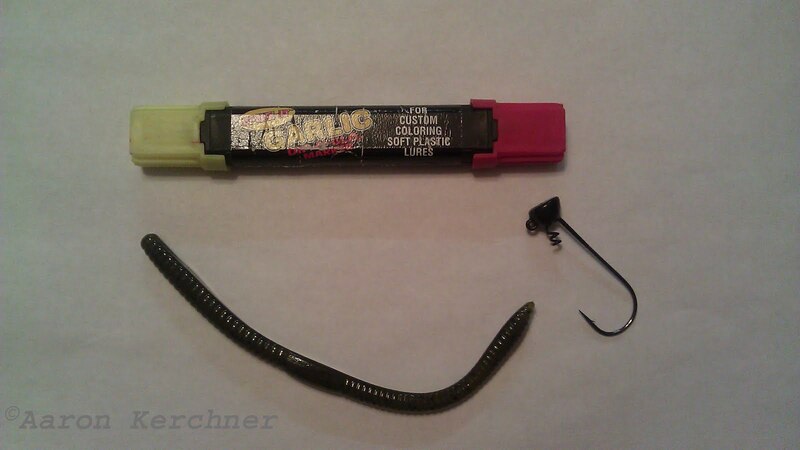 We found one of the best combinations was a gold/blue dodger with an orange/purple squid on the lead core. We also did well with a silver dodger with a gold/chartreuse Kastmaster. In total we caught 17 Lake Trout, all between 13-16 inches. 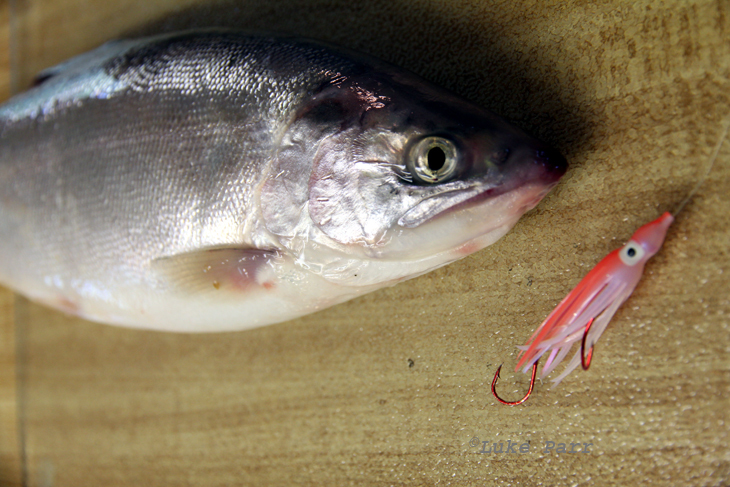 We also caught one Kokanee Salmon on the squid. While we would have certainly enjoyed catching a couple larger fish, it wasn't meant to be. The Lake Trout and Salmon that we got were all between about 25-50 feet down, in the deeper parts of the lake tried fishing the down rigger down to about 120 feet and jigging from 80-200 feet down. The deeper depths didn't produce anything. Overall, we were excited with the catch, especially since we had never been to the reservoir before. Thanks to the Fishexplorer forums, a Fish-n Map and the Humminbird fish finder giving us accurate information, we felt like we did well. I didn't want to make this post too long, so I will write more about the fish finder in a later post, I will also post some more information on Green Mountain Reservoir, just like I have done for some of the other lakes. Until then, keep fishing and check back soon for more posts! If you saw my last post, you know that we tried to go fishing at Dillon Reservoir, but it didn't go so well. I figured in honor of Dillon Reservoir I would go ahead and post some information. Dillon Reservoir is located along I-70, east of Eisenhower Tunnel. The cities of Dillon, Silverthorne and Frisco all wrap around parts of the Reservoir. You can also access boat ramps from both Dillon and Frisco. Multiple campgrounds located around the lake. The lake is free to use, camping may have associated fees. 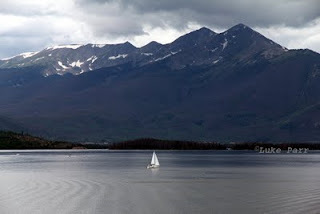 Dillon Reservoir is extremely popular for sailing enthusiasts and offers plenty of wind and water to explore in your sail boat. Dillon seems to be a little less popular for fishing though. When preparing to flood the Reservoir, crews clear cut the forests to make way for the water. As a result there was a lot less biomass in the Reservoir to begin with. As a result, Dillon Reservoir is often considered to be fairly sterile. While this doesn't mean that there are no fish to catch, it just means that they may be a little harder to catch than some other places. So we decided to take the boat out yesterday to try out the new fish finder, check out a new lake and just enjoy a few hours with a beautiful view. We decided to head up to Dillon Reservoir as we had never taken the boat out on that lake. We started out leaving a little later than we wanted to, but that wasn't necessarily a big deal. While driving we noticed that there seemed to be something sticking out of the inside of one of the tires. 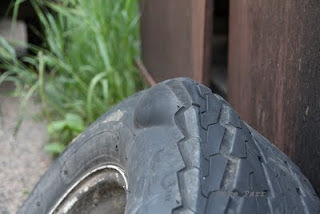 We stopped to check it out and noticed that there was a large bulge just below the tread. We went ahead and changed out the tire to make sure that it didn't blow out on I-70. Once in the water we tried to fire up the motor. Unfortunately the starter ran, but the engine would not turn over. We spent close to ten minutes with the boat on the trailer, in the water, trying to figure out what the problem was. We eventually gave up and pulled the boat back out of the water. We had lunch at the park near the ramp, but didn't end up doing any fishing. When we got home we put the "rabbit ears" on the motor so that we could start it up out of the lake. We noticed that the air intake was completely closed while the shift lever was in neutral. As we played with it a little we tried the motor again and it fired right up without a problem. We were relieved that the problem seemed to be fixed, but it was certainly frustrating to drive all the way to the lake, and not be able to get out. Hopefully next week we will get out on Spinney Mountain or somewhere to try out the fish finder. I'll try to update you when I get a chance to actually use the fish finder out on the water. Do you have any frustrating fishing stories? Please share them below in the comment section.